Photograph collection of webmaster All the paintwork visible on D7529 shines and glistens as it stands at Platform 1, Derby, suggesting that the locomotive is only a day or two out of Derby Locomotive Works, sometime during February 1965. The seventeen year career of D7529/25179 was spent allocated to only three London Midland Region depots. August 1969 to the London (Western Lines) Division (D01). 25179 was the 147th Class 25 withdrawn, one of twelve retired during November 1982, including sisters 25177, 25180, 25186 & 25187. After withdrawal 25179 was stored at Springs Branch from December 1982 until June 27th 1984 when it was moved with 25130/141/188 to Swindon Works. 25179 was broken up here by the middle of February 1987. Noted Derby Works April - May 1977 (Classified). With its last thirteen years spent allocated to London area depots the potential for 7529/25179 to obtain passenger workings was not great. 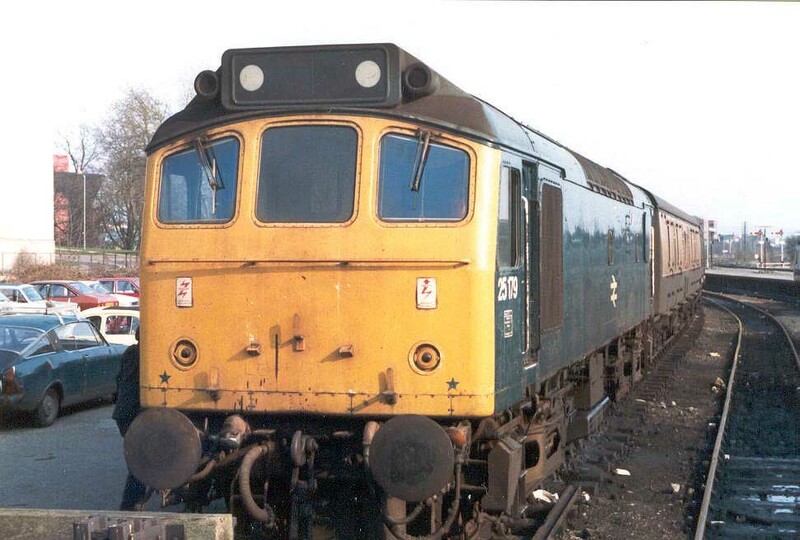 However one short working that would have been handled by a very few Class 25's, was the Bedford St John's - Bletchley line, covering most likely for an absent diesel multiple unit. On October 29th 7529 worked a Bedford St. Johns - Bletchley service, a grand total of 16 miles. On the late evening of May 25th 7529 was stabled at Stonebridge Park coupled to 7526. On May 29th a roundtrip Wolverhampton (?) - Porthmadog charter was worked by 25179 & 25187. On October 7th & 14th 25179 worked the Fridays only Washwood Heath - Hethersett tanks, retiring to Norwich depot before returning west. This was a regular Class 25 turn at this time. March 9th brought trouble to the Wembley area when an engineers train led by 25236 had three wagons become derailed as they split the trap points on leaving the up loop. Both slow lines were blocked, Willesden had to borrow 25179 from Cricklewood to attend with the breakdown crane, which was in fact not needed, the errant wagons being rerailed by other means. On July 28th 25179 & 25053 worked the 08.52 Leicester - Skegness to Nottingham, being replaced here by 20006 & 20030. On August 1st 25179 was noted westbound at March with a mixed freight. The remainder of 25179's passenger haulage involved the Midland mainline. On August 7th 25179 & 25264 worked a Leicester - St. Pancras service. 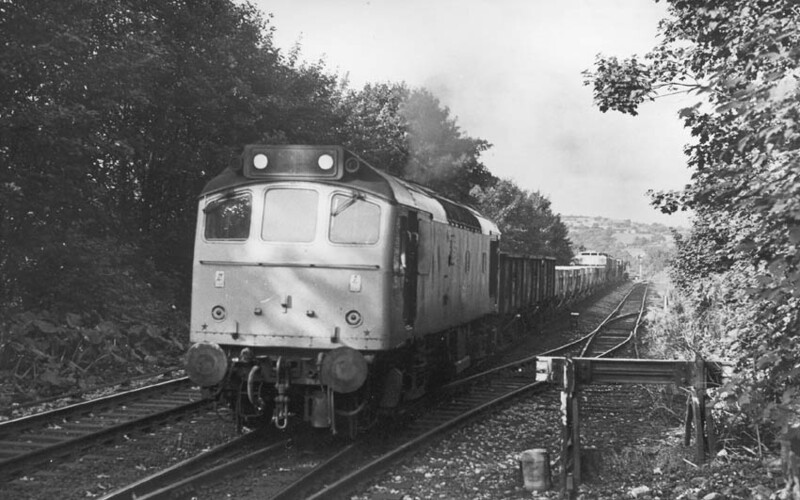 Photograph collection of webmaster An eastbound freight hauled by 25179 passes through New Mills, date unknown. 25179 was stabled at Warrington Arpley on March 7th. On April 28th 25179 was noted at Cockshute yard. 25179 was noted at Milford Junction on May 9th on a freight service. 25179 was stabled at Wellingborough on May 25th. On September 24th 25179 was noted eastbound at Chinley with empty ICI stone hoppers. 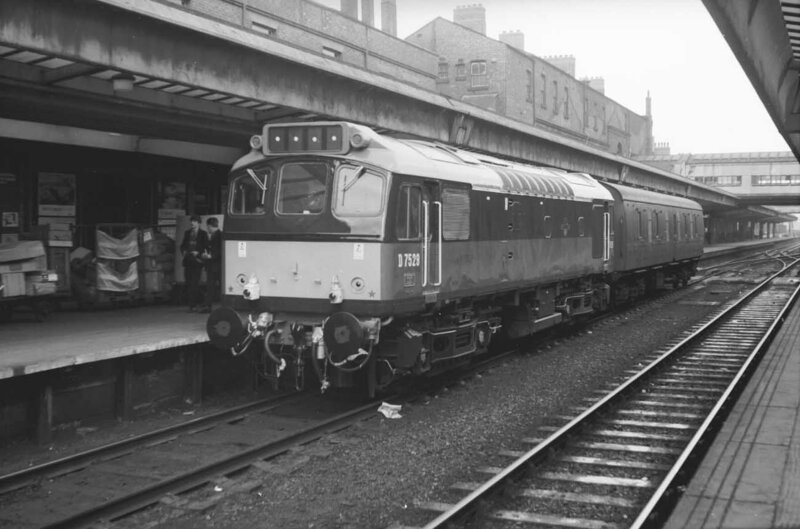 A heavily loaded 15.02 Bristol – Manchester parcels on October 9th used 25177 & 25179. 25179's last passenger haulage involved rescuing 45131 on the 08.48 St. Pancras - Sheffield forward from Bedford, the date is stated as either November 4th or November 11th. Photograph courtesy Mark Cook Class 25s at Aylesbury invariably meant parcels traffic, here 25179 waits on April 1st 1982 for its next duty. In its last week of service 25179 was noted passing eastbound through Manchester Victoria with spoil & coal wagons, November 26th. 25179 was withdrawn on November 28th 1982. At least one cabside number panel with TOPS panel escaped scrapping. Page added February 11th 2013.